Last night, I fell in love with a bottle of gin. I've had love affairs with vodka and spiced rum in the past, the former ending not so pleasantly, and the latter currently in the stages of "I'm just not that into you anymore." 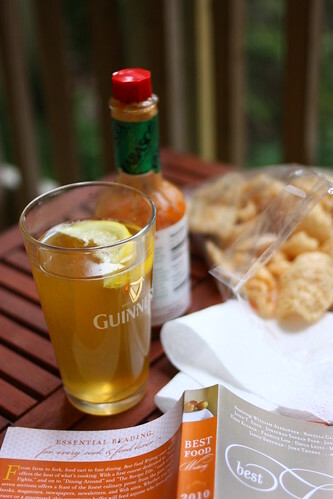 Beer remains a constant companion, but usually in small doses, preferably served with a slice of something citrusy and a bag of pork rinds, and enjoyed outside, in the heat, on a porch. I've stayed far away from whiskey, seeing with my own two eyes how it does bad things to good people. And a bottle of gin, when consumed almost in its entirety by a certain houseguest, has been known to lead to broken apple corers and a urine-stained bath mat. Despite that last unfortunate experience, I bought a bottle last night. Technically, the first actual bottle I got was over the weekend, after I suddenly declared "I want a Pimm's Cup" while driving home from the mall with Murdo on Saturday, and because he never opposes a good drink (or any drink, really), he took me to the liquor store shortly thereafter. Pimm's No. 1 Cup is a British gin-based liqueur flavored with hints of herbs and citrus. I first read about it over at Orangette, and while I wasn't too interested in the drink recipe itself, I liked the way the bottle looked and the way Pimm's sounded, so I stored the name away for later. Then I heard someone order a Pimm's Cup in an episode of "Boardwalk Empire," and Murdo remembers the drink from an episode of "Californication" (yes, we watch a lot of TV), and if the drink managed to make its way from the Atlantic City Prohibition era to Venice Beach, California, circa 2009, well, I wanted to try it. This recent post over at Shutterbean sealed the deal. The recipe on the back of the bottle mixes Pimm's with ginger ale and a lemon twist, and it's a very good drink -- crisp, refreshing, tasty. You can't even really tell you're drinking alcohol, and not in the way that can get you in trouble, but in the way that there actually isn't that much alcohol in the drink to begin with. Which is my main problem with it. So last night I bought a bottle of Tanqueray, and I added the gin with the Pimm's, and had two glasses of the stuff, and then slept very, very well. The shot of gin adds an extra kick that says, "Oh yeah, this is a grownup drink," at least to me anyway, the girl who has been ordering Captain and Diets for so long it's kind of embarrassing. I don't have a photo of the drink to share with you. Sorry. But I figure you already know what a cocktail looks like, so I don't feel that bad. Instead, I'll leave you with these photos that have nothing to do with cocktails, and everything to do with the Filipino food (adobo ribs, fresh lumpia, beef mechado, blue crabs) and blackberry almond tart (made by Jenny) that I ate over the weekend with my family. Yeah, it was a good weekend. This is more like a combination of Pimm's Cup and Pimm's Turbo, which mixes Pimm's No. 1 with gin and lemonade. But Pimm's Cup is so much more fun to say. You can find more Pimm's recipes here. Fill a tall glass halfway with ice. Add the Pimm's and the gin. Fill the rest of the glass with 7-up or ginger ale. Garnish with a lemon slice. Drink it up. Repeat as needed. Yay! A post about a drink, how very refreshing! Often I forget beverages are also an important part about food. Which then begs the question, when will you write about mom's Cantaloupe juice? Also, I want to try a Pimm's cup. I love gin! Also, there are these delicious cookies you can get at the grocery store called Pims. Think soft cookie with orange gel covered in a thin dark chocolate layer. Pim! I've long been fascinated by Pimm's Cups and I recently tried it for the first time and LOVED it. Something about it just feels so fancy and European to me. I love it with cucumber spears in it. you are so grown up to be consuming gin! i tried it once and it was not pretty. 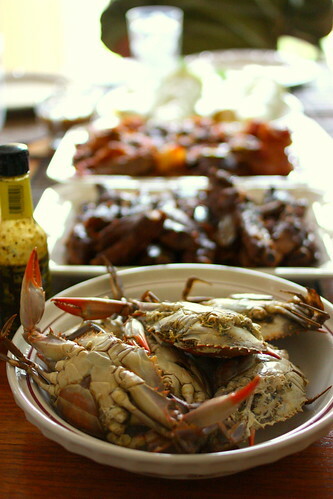 you weekend feast looks amazing. i'm especially in love with the tart. are you going to share the recipe for that? OK, all those photos at the end? It all looks so good, and now I am starving! Tanqueray! Now there is a name from my past. I've also always thought Pimm's Cup had such a nice sound to it. Maybe I'll give it a go! 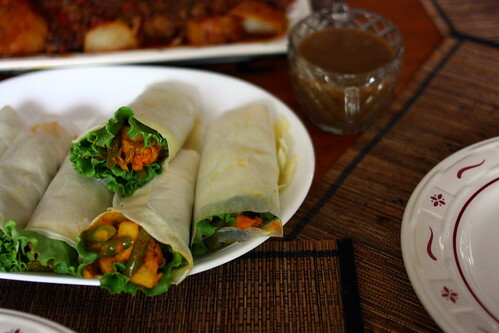 Meanwhile, I love the looks of your Filipino feast! I also read about it over at Orangette and was more interested in the story than reading the recipe, but you have definitely peaked my interest in trying it. It sounds very refreshing and like it would go great with barbecue. Jenny - You should come over for Pimm's and board games! And I'd forgotten all about Mom's canteloupe juice! Although I think I'd rather just eat canteloupe straight. Alejandra - It does feel fancy. Must be the British thing. I didn't have any cucumbers but I'll add some next time! Shanna - Thank you! Go eat! 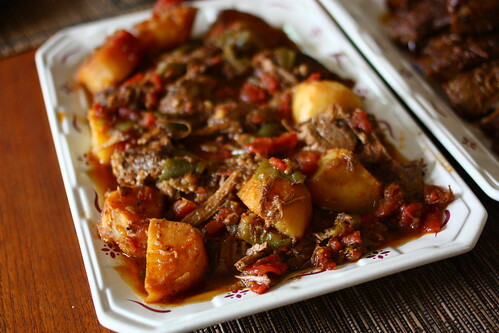 ChichaJo - Definitely try it. And thank you! Jen - It's a perfect drink for a summer day! You and your camera. So good, Jacqui. Thanks, Jess. I haven't been spending much time with my cameras lately. That needs to change. I've been meaning to try this and appreciate your glowing recommendation :) My husband is the same way about trying new drinks, he's all over it. I'm going to be sharing my favorite summer drink shortly. I just love sipping something cold when the weather is warm. mmm adobo ribs! i haven't made my way to gin yet, but this pimm's cup with ginger ale sounds like the perfect summer refresher, must try! I have never had Pimms before... but I like the way it sounds :o) I first noticed it in a Jamie Oliver Recipe... it was a dessert with strawberries & not sure what else. The pictures near the bottom are making me wish I could go to one of your family dinners :o) Hope you're having a great memorial day weekend, Jacqui! Love Pimm's cups! You should try Hendrick's gin if you really start getting into gin. 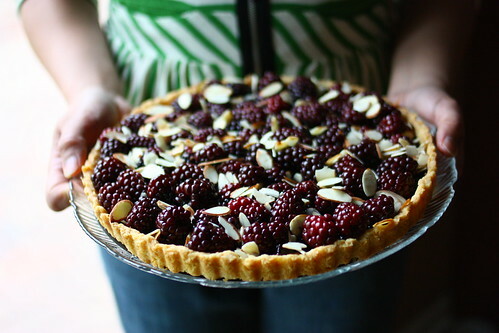 And hey, that tart looks beautiful!! OH MAN, your feast looks so yummy - it literally made my stomach growl. I've never had Pimm's Cup and I love gin, so I'll have to go and buy myself a bottle. I agree with Megan Gordon above...Hendricks over ice with some sliced cucumbers is heavenly. As always, your photos stun me. NicoleD - Warm weather + fun cocktails are just meant to be! I've decided I need to experiment more with drinks. 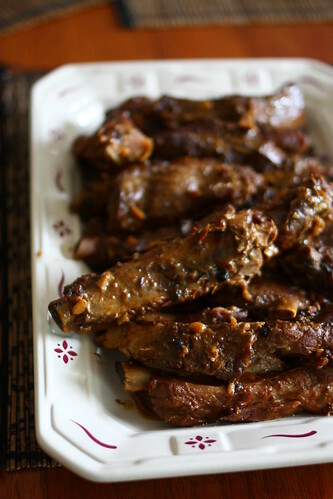 LetMeEatCake - Adobo ribs is Murdo's favorite Filipino food! Gin is awesome -- very light and refreshing, I think! 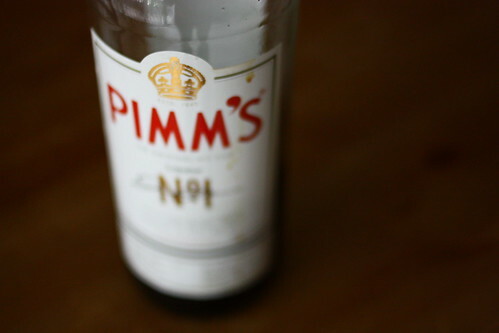 Linnea - Oh yeah, I bet Pimm's would be great in a dessert. You're welcome to one of our family dinners any time! Stephanie - If you love gin, you must try Pimm's. Go! And thank you! Pimm's Cup is my beverage of choice all summer long! Definitely try it. And thanks for your sweet comments!